With its beautiful natural scenery and lovely architecture, cobblestone streets and majestic oaks draped with Spanish moss, the southern coastal city of Savannah offers the ideal setting for a wedding. Whether you’re dreaming of a grand affair with hundreds of guests or an intimate gathering with only close friends and family, there are numerous venues to choose from and an array of options to make your special day unforgettable. Savannah is one of the most romantic cities in the country, so it’s no surprise there is a diverse array of choices to host your wedding. From outdoor, waterfront and beachside locations, to country squares, historic homes, museums and much more—there’s something to suit everyone’s vision. Many of the venues offer catering options and complete wedding packages. Here’s a list of some of the top wedding venues in the city. A historic square framed by towering oaks and St. John’s Cathedral, Lafayette Square is a top choice for an outdoor Savannah wedding. A beautiful fountain in the center of the square makes an ideal backdrop for wedding photos—as do the horse drawn carriages that stop frequently. 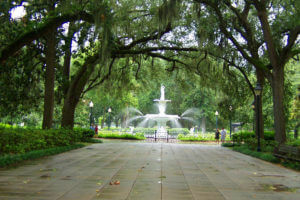 Another beautiful choice for an outdoor ceremony is Savannah’s iconic Forsyth Park. Here, there are many spots, including by the famous Forsyth fountain, to exchange vows with picturesque scenery all around. Because of its popularity, the park is often booked a year in advance; so once you decide, make sure to reserve it early. Romance abounds at this stately Georgian mansion that is steeped in history and southern charm. This venue offers an elegant ballroom or a sunny courtyard for large or more intimate events. One of Savannah’s many historic houses, the Mackey House is a colonial mansion with exquisite gardens, wooden porch swings, a pond and more for a fairytale wedding. The 4,000 square foot estate is a top choice among couples and offers numerous options for a large or small wedding. Those looking for a venue that exudes rustic charm as well as rich Georgia heritage, this unique spot delivers. Outdoor spaces lined with ancient brick walls and indoor choices with wooden beams and industrial ambiance make the perfect setting for a romantic celebration. Home to the largest private gardens in the Historic District, this peaceful spot is a heavenly option for a wedding. Striking greenery and perfectly manicured gardens add to its allure, as does its elegant ambiance. Whether you’d like to exchange vows by the water, on the beach or inside the country club, the Savannah Yacht Club has dreamy weddings down pat. This venue is one of the city’s most coveted, providing enough space for a large group. Three unique venues, each with a different atmosphere, the Telfair Museums are amongst the most architecturally beautiful spots in Savannah. Whether you lean towards a more contemporary feel like the Jepson, the sophistication of the Telfair Academy or a quaint garden party at the Owens-Thomas House, each museum has its own distinct charm and offers a myriad of possibilities for your wedding. After you’ve chosen the perfect venue, plan your perfect entrance by booking the Old Town Trolley’s Savannah Wedding Trolley! Our silver wedding trolley will transport you and your entire wedding party to your venue in elegance and style. Simply beautiful and exuding romance, the trolley is climate controlled to keep you and all your bridesmaids, groomsmen and anyone else you’d like to be onboard comfortable as you travel to and from your wedding venue. The trolley is also equipped with ice-filled coolers and stocked with water bottles. It seats up to 25, so you can celebrate together before and after the big event.